Pablo Picasso is probably the most important figure of 20th century, in terms of art, and art movements that occurred over this period. Before the age of 50, the Spanish born artist had become the most well known name in modern art, with the most distinct style and eye for artistic creation. There had been no other artists, prior to Picasso, who had such an impact on the art world, or had a mass following of fans and critics alike, as he did. Pablo Picasso was born in Spain in 1881, and was raised there before going on to spend most of his adult life working as an artist in France. Throughout the long course of his career, he created more than 20,000 paintings, drawings, sculptures, ceramics and other items such as costumes and theater sets. He is universally renowned as one of the most influential and celebrated artists of the twentieth century. Picasso's ability to produce works in an astonishing range of styles made him well respected during his own lifetime. After his death in 1973 his value as an artist and inspiration to other artists has only grown. He is without a doubt destined to permanently etch himself into the fabric of humanity as one of the greatest artists of all time. As an artist and an innovator, he is responsible for co-founding the entire Cubist movement alongside Georges Braque. Cubism was an avant-garde art movement that changed forever the face of European painting and sculpture while simultaneously affecting contemporary architecture, music and literature. Subjects and objects in Cubism are broken up into pieces and re-arranged in an abstract form. During the period from approximately 1910-1920 when Picasso and Braque were laying the foundation for Cubism in France, it's effects were so far-reaching as to inspire offshoots like the styles of Futurism, Dada, and Constructivism in other countries. Picasso is also credited with inventing constructed sculpture and co-inventing the collage art style. He is also regarded as one of three artists in the twentieth century credited with defining the elements of plastic arts. This revolutionary art form led society toward societal advances in painting, sculpture, printmaking and ceramics by physically manipulating materials that had not previously been carved or shaped. These materials were not just plastic, they were things that could be moulded in some way, usually into three dimensions. Artists used clay, plaster, precious metals, and wood to create revolutionary sculptural art work the world had never seen before. Picasso was born in Malaga, Spain, to Don Jose Ruiz y Blasco and Maria Picasso y Lopez. His baptized name is much longer than the Pablo Picasso, and in traditional Andalusian custom honored several saints and relatives. His father was a painter and a professor of art, and was impressed by his son's drawing from an early age. His mother stated at one time that his first words were to ask for a pencil. At the age of seven Picasso begin receiving formal training from his father. Because of his traditional academic training, Ruiz believed training consisted of copying of masterworks and drawing the human form from live figure-models and plaster casts. In 1891 at ten years old, the family moved to A Coruna where School of Fine Arts hired Ruiz to be a professor. They spent four years there where Ruiz felt his son surpassed him as an artist at the age of 13 and reportedly vowed to give up painting. Though paintings by Ruiz still seem to have been generated years later, Picasso's father certainly felt humbled by his son's natural skill and technique. Picasso and his family were horrified when his seven year old sister died of diphtheria in 1895. They relocated to Barcelona and Ruiz began working at its School of Fine Arts. He persuaded officials there to let his son take an entrance exam for an advanced class and Picasso was admitted at the age of just 13. At the age of 16 he was sent to Spain's foremost art school in Madrid, the Royal Academy of San Fernando. Picasso disliked the formal instructions and decided to stop attending his classes soon after he arrived. He filled his days inside Madrid's Prado, which displayed paintings such as Francisco Goya and El Greco. The body of work Picasso created throughout his lifetime is enormous and spans from his early childhood years until his death, creating a more comprehensive record of his development than perhaps any other artist. When examining the records of his early work there is said to be a shift where the child-like quality of his drawings vanished, therefore being the official beginning of his career. That date is said to be 1894, when Picasso was just 13. At the age of 14 he painted Portrait of Aunt Pepa, a striking depiction that has been referred to as one of the best portraits in Spanish history. And at age 16, Picasso created his award-winning Science and Charity. His technique for realism, so ingrained by his father and his childhood studies, evolved with his introduction to symbolist influences. It led Picasso to develop his own take on modernism, and then to make his first trip to Paris, France. The poet Max Jacob, a Parisian friend, taught Picasso French. They shared an apartment where they experienced the true meaning of what it meant to be a "starving artist." They were cold and in poverty, burning their own work to keep the apartment warm. Picasso would predominately spend his working adult life in France. His work has been divided roughly by periods of time in which he would fully develop complex themes and feelings to create a unifying body of work. The somber period within which Picasso both personally experienced poverty and its effect on society right around him is characterized by paintings essentially monochromatic paintings in shades of blue and blue-green, only occasionally warmed by other colors. Picasso's works during this period depict malnutrition, prostitution, and the posthumous portraits of friend Carlos Casagemas after his suicide, culminating in the gloomy allegorical painting La Vie. La Vie (1903) portrayed his friend's inner torment in the face of a lover he tried to murder. Fitting to the name, once Picasso seemed to find some small measure of success and overcame some of his depression, he had a more cheery period featuring orange and pink hues and the playful worlds of circus people and harlequins. Picasso met a bohemian artist named Fernande Olivier who became his lover. She subsequently appeared in many of these more optimistic paintings. American art collectors Leo and Gertrude Stein became great fans of Picasso. They not only became his chief patrons, Gertrude was also pictured in his Portrait of Gertrude Stein, one of his most famous portraits. For Picasso, the seminal moment was the Paul Cezanne retrospective held at the Salon d'Automne, one year after the artist's death in 1906. Though he previously had been familiar with Cezanne, it was not until the retrospective that Picasso experienced the full impact of his artistic achievement. In Cezanne's works, Picasso found a model of how to distill the essential from nature in order to achieve a cohesive surface that expressed the artist's singular vision. In about the same time, the aesthetics of traditional African sculpture became a powerful influence among European artists. In France, Henri Matisse, Pablo Picasso, and their School of Paris friends start blending the highly stylized treatment of the human figure in African sculptures with painting styles derived from the post-Impressionist works of Cezanne and Gauguin. Les Demoiselles d'Avignon was Picasso's first masterpiece. The painting depicts five naked women with figures composed of flat, splintered planes and faces inspired by Iberian sculpture and African masks. The compressed space the figures inhabit appears to project forward in jagged shards; a fiercely pointed slice of melon in the still life of fruit at the bottom of the composition teeters on an impossibly upturned tabletop. In this painting, Picasso makes a radical departure from traditional European painting by adaptation of Primitivism and abandonment of perspective in favor of a flat, two-dimensional picture plane. When Les Demoiselles d'Avignon first appeared, it was as if the art world had collapsed. Known form and representation were completely abandoned. Hence it was called the most innovative painting in modern art history. With the new strategies applied in the painting, Picasso suddenly found freedom of expression away from current and classical French influences and was able to carve his own path. Formal ideas developed during this period lead directly into the Cubist period that follows. Others have seen what is and asked why. I have seen what could be and asked why not." It was a confluence of influences - from Paul Cézanne and Henri Rousseau, to archaic and tribal art - that encouraged Picasso to lend his figures more weight and structure around 1907. And they ultimately set him on the path towards Cubism, in which he deconstructed the conventions of perspective that had dominated Renaissance art. During this period, the style Georges Braque and Picasso developed used mainly neutral colors and was based in they're "taking apart" objects and "analyzing them" in terms of their shapes.Cubism, especially the second form, known as Synthetic Cubism, played a great role in the development of western art world. Works of this phase emphasize the combination, or synthesis, of forms in the picture. Colour is extremely important in the objects' shapes because they become larger and more decorative. Non-painted objects such as newspapers or tobacco wrappers, are frequently pasted on the canvas in combination with painted areas - the incorporation of a wide variety of extraneous materials is particularly associated with Picasso's novel technique of collage. This collage technique emphasizes the differences in texture and poses the question of what is reality and what is illusion in painting. With his use of color, shape and geometrical figures, and his unique approach to depict images, Picasso changed the direction of art for generations to come. With an unsurpassed mastery of technique and skill, Picasso made his first trip to Italy in 1917 and promptly began a period of tribute to neoclassical style. Breaking from the extreme modernism he drew and painted work reminiscent of Raphael and Ingres. This was just a prelude before Picasso seemingly effortlessly began to combine his modernist concepts with his skill into surrealist masterpieces like Guernica, (1937), a frenzied and masterful combination of style that embodies the despair of war. Guernica is considered as the most powerful anti-war statement of modern art. It was done to showcase Picasso's support towards ending war, and a condemnation on fascism in general. From the beginning, Picasso chooses not to represent the horror of Guernica in realist or romantic terms. Key figures - a woman with outstretched arms, a bull, an agonized horse - are refined in sketch after sketch, then transferred to the capacious canvas, which he also reworks several times. Dark color and monochrome theme were used to depict the trying times, and the anguish which was being suffered. Guernica challenges the notions of warfare as heroic and exposes it as a brutal act of self-destruction. The works was not only a practical report or painting but also stays as a highly powerful political picture in modern art, rivaled by a few fresco paintings by Mexican artist Diego Rivera. Picasso's final works were a mixed between the many styles he'd embraced throughout his life. He dared to make sculptures larger and his paintings more expressive and colorful. Towards the end of his career, Picasso enjoyed examining Classical works that had influenced his development over the years, and produced several series of variations of paintings of Old Master, including Francisco Goya, Diego Velazquez, and Edouard Manet, the founder of modern traditions. Some of the most notable works he did, include Massacre in Korea after Goya, Las Meninas after Velazquez, and Luncheon on the Grass after Manet. Many of these pieces are still influential in the art world today; and, in fact, due to the vision and distinct creative style, are still among some of the most innovative pieces which have been introduced to the art world, even during recent years. A multitude of paintings Picasso painted during his final years are now widely accepted as the beginning of the Neo-Expressionism movement. 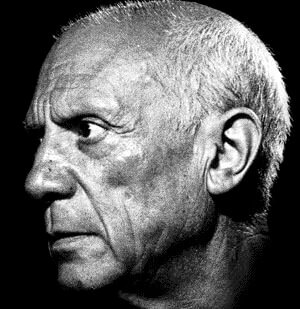 When Picasso died at age 91 in April 1973, he had become one of the most famous and successful artist throughout history. Leonardo da Vinci of the 20th Century, Picasso's true greatness and significance lie in his dual role as revolutionary and traditionalist at once. Uniquely in the 20th century he was capable of radical innovation on the one hand but on the other of continuing traditional lines. Thus in Les Demoiselles d'Avignon he vanquished the representational picture, while in Guernica he revive the genre of historial painting in a new form. He is also undeniably the most prolific genius in the history of art. His career spanned over a 78 year period, in which he created: 13,500 paintings, 100,000 prints and engravings, and 34,000 illustrations. Picasso was, and still is, seen as a magician by writers and critics, a metaphor that captures both the sense of an artist who is able to transform everything around him at a touch and a man who can also transform himself, elude us, fascinate and mesmerise us. Just like William Shakespeare on literature, and Sigmund Freud on psychology, Picasso's impact on art is tremendous. No one has achieved the same degree of widespread fame or displayed such incredible versatility as Pablo Picasso has in the art history. Picasso's free spirit, his eccentric style, and his complete disregard for what others thought of his work and creative style, made him a catalyst for artists to follow. Now known as the father of modern art, Picasso's originality touched every major artist and art movement that followed in his wake. Even as of today, his life and works continue to invite countless scholarly interpretation and attract thousands of followers around the world.